Home » Greenroom » What Standards Does Your First Aid Kit Meet? What Standards Does Your First Aid Kit Meet? A properly designed and equipped first aid kit is designed to bring relief to injured people in an emergency. A well maintained and stocked kit could end up saving a life. Therefore, a first aid kit not only provides peace of mind to a business owner it has, in fact, become mandatory. Having a compliant kit in every workplace is essential for the safety of you and your colleagues. It also takes away the risk of legal action and fines in case you fail to properly respond to an inevitable workplace emergency. What Standard Does Your First Aid Kit Need To Comply With? Safe Work Australia published a Model Code of Practice about First Aid in the Workplace in July 2012. This Model Code of Practice (and its subsequent revision in March 2015) makes it mandatory to provide adequate first aid facilities in the workplace. The Code also has details of the contents of a general first aid kit which would suffice for most workplaces. Your workplace can then customise each first aid kit and add additional items or more quantities of existing items depending upon its specific requirements.If you run a restaurant, it would be prudent to keep more supplies to deal with a burn injury. If you are the manager of an old age home or child care centre, do keep age appropriate supplies. It is important to remember that this table lists the basic supplies which every workplace first aid kit should contain in order to comply with standards. Of course, if you take advantage of a managed first aid kit service such as that of Alsco, you are sure to get a first aid kit that complies with WHS standards. In fact, our unique electronic tracking system complemented with our regular service and restocking ensures that your kit (and your workplace) are compliant not just on day one but day after day. 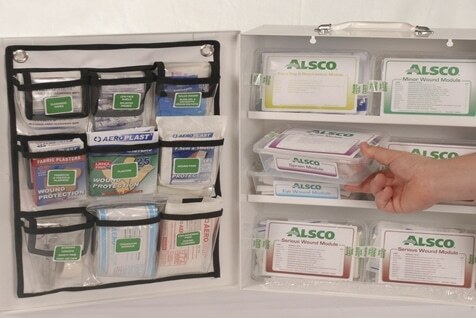 So let Alsco handle your first aid kit maintenance for you… today and tomorrow. Get the best price quote now.